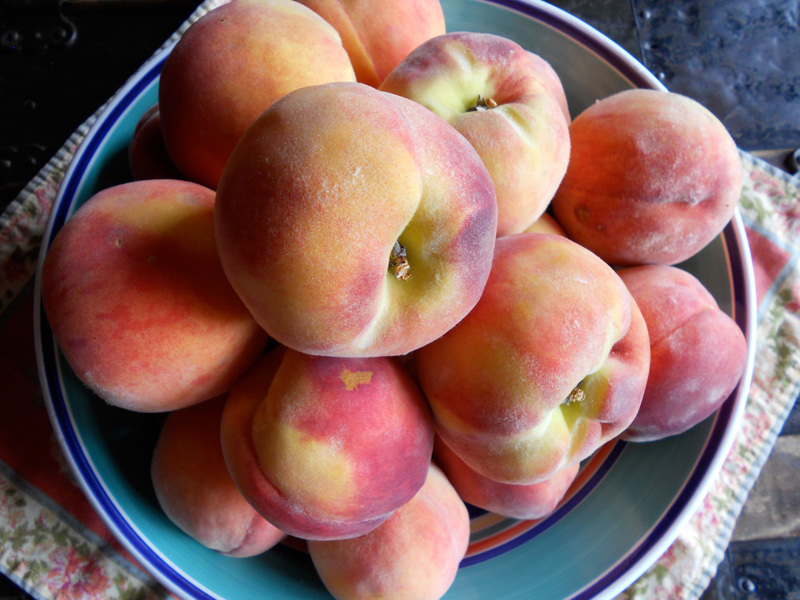 Friends brought us ten pounds of organic Okanagan peaches a couple weeks ago. The Okanagan Valley is a region of southern British Columbia, Canada renowned for beautiful lakes, fruit production and vineyards. 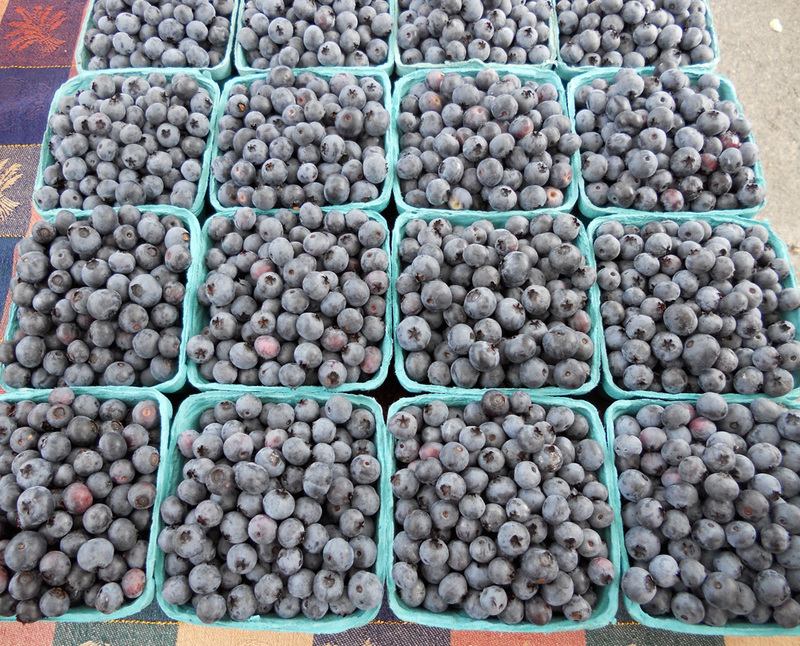 A few days later we made our weekly walk over to Moss Street Market and found an abundance of blueberries. Both fruits were so flavourful and juicy, it was hard to save them for cooking as I just wanted to eat them all right then. I did manage to save enough for a few recipes! 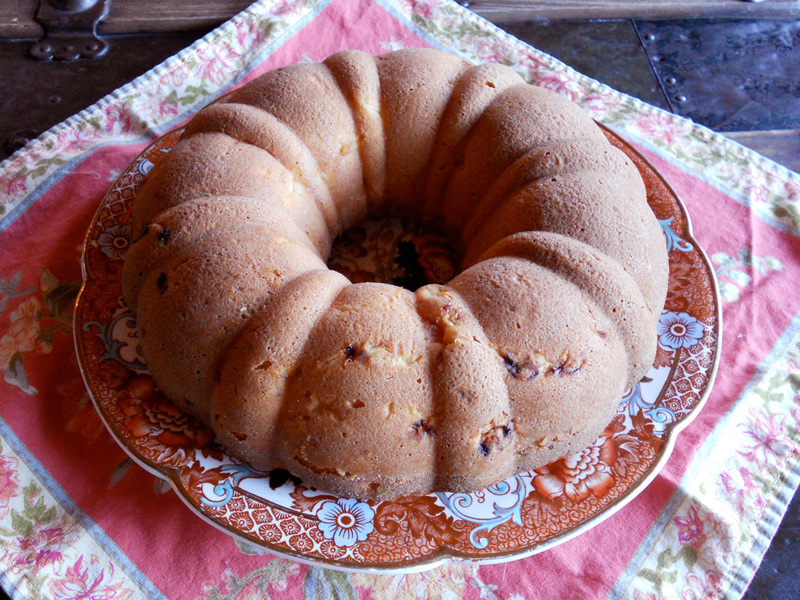 We made an amazing meal, which began with peach-blueberry sangria and ended with peach cake. The meal in between was mostly from Sinfully Spicy: we made Murgh KaliMirh (Black Pepper Chicken), Palak Aaloo (Spinach Potato Stirfry), Baingam Bharta (Smoky Mashed Eggplant), as well as fragrant rice, dahl and chapatis. Topping it all off was locally-made rhubarb chutney and lemon pickle. This was just a simple sangria. 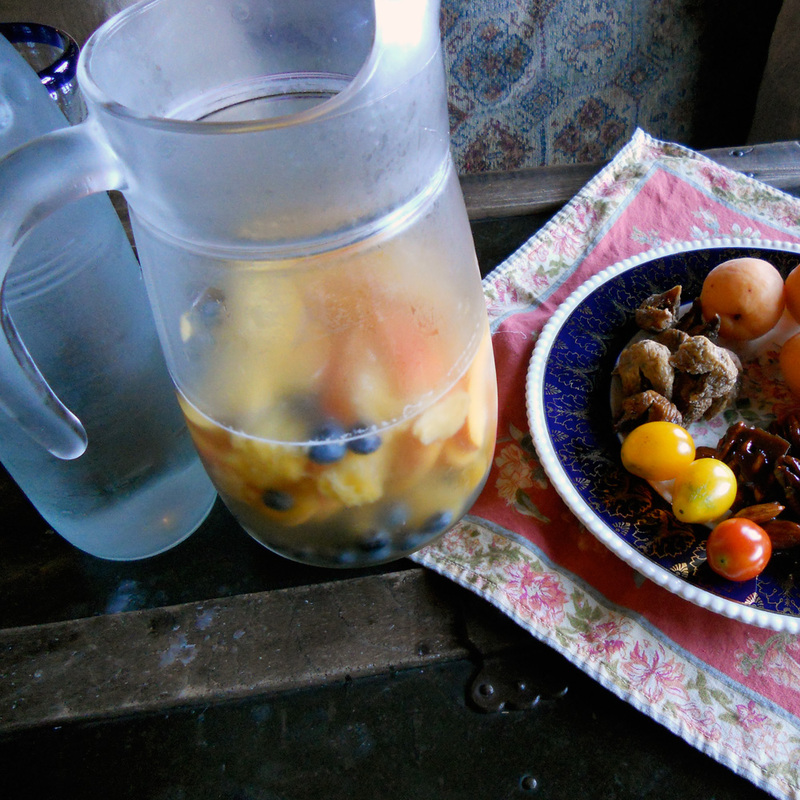 I added a thinly-sliced lime, sliced peaches and blueberries to a jug. Another peach was roughly puréed and added along with a bottle of Pinot Grigio. This sat in the fridge for a few hours and we added ice and sparkling water when served. It was simple and refreshing. Peach cake was the only cake my mother ever made from scratch. She had one cookie recipe, one cake recipe and about ten dinner meals from which she never deviated. This cake was a once-a-year treat if we were lucky. I think the recipe is from her one-and-only cookbook: a small fat book with a cloth cover from the first half of the 20th century, the name of which I have long forgotten. I used vanilla sugar for extra flavour. This is a very simple cake and benefits from the love of whipped cream or ice cream to make it really special. As I didn’t have a 9-inch square pan, I tried making it in a bundt pan, which didn’t work perfectly: it was a bit dry. Next time I would try a 9- or 10-inch spring form pan and adjust the baking time. Preheat over to 375°F. Grease and flour a 9-inch square pan. Cream butter and sugar. Add eggs one at a time, beating well after each egg. Sift together dry ingredients and add alternately with milk to creamed mixture, starting and ending with dry. Add peaches and stir to combine. Bake 30 to 35 minutes. Serve with plain or brandy-laced whipped cream or good vanilla ice cream. 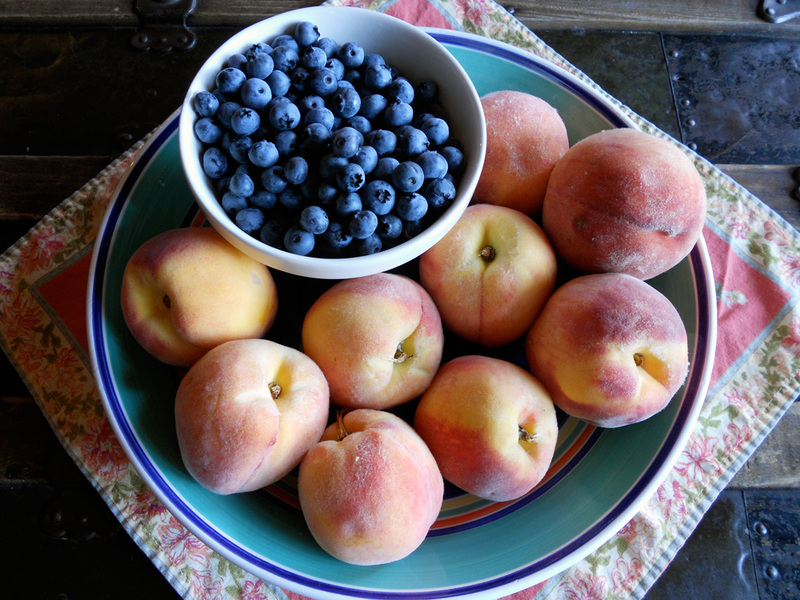 The following morning I made peach-blueberry pancakes. 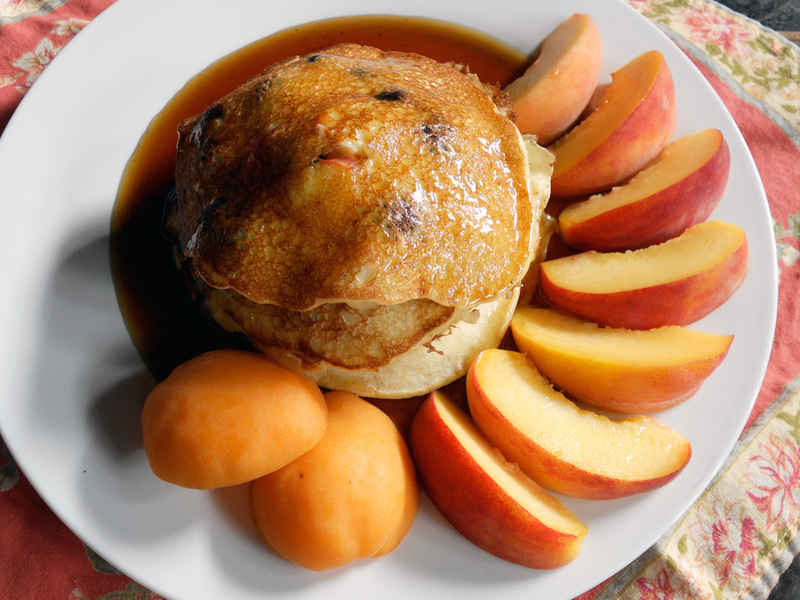 I don’t use a recipe for pancakes, everyone seems to have a recipe they love. I prefer a thinner batter, so I use about one part dry ingredients (flour, sugar, baking powder, salt) to one and a quarter parts wet (milk, yogurt, egg, melted butter). They were delicious and I ate far to many of them! 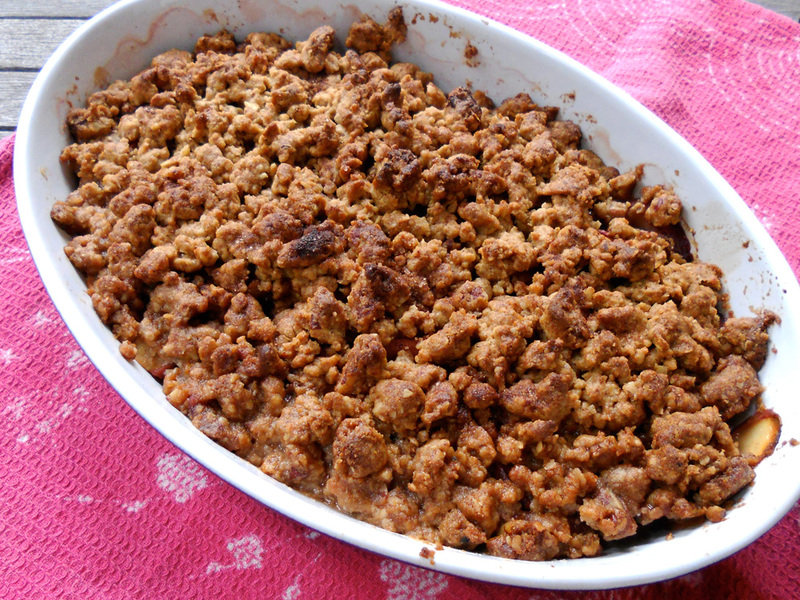 The last item I baked was a gluten-free peach crumble. We brought it to a wonderful dinner cooked by delightful friends who made us salmon, German potato salad, tomato salad and corn on the cob: all fresh and local. Preheat over to 350°F. Combine 8-12 sliced fresh peaches with 1/4 cup of maple syrup, 2 tablespoons of sherry, brandy or rum and 2 teaspoons pure vanilla extract and add to your baking dish (I used a 9×13-inch oval). Combine all these ingredients in a large bowl and mix together with your hands until you have a crumbly mixture. Spread over the peaches and bake until golden and bubbling, about 40 minutes. *Most oats are processed with wheat, so if you are baking for people with celiac disease, make sure you find wheat-free oats and oat flour.